This sturdy soil scoop is constructed from stainless steel and birch. 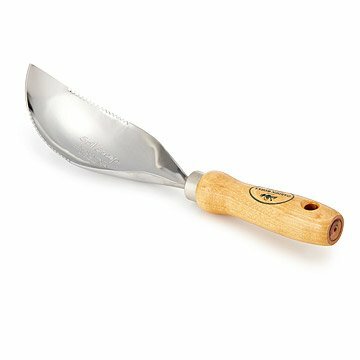 With a premium stainless steel blade and solid birch handle, this sturdy soil scoop is built to be a perennial go-to tool in your garden bag. It features a large leaf-shaped scoop with serrated edges for excavating dense, root-filled soil, with a pointed tip that's great for more precise cultivation like creating seed furrows. 100% USA made. I've only had this for a couple weeks, but already love it! Use it every day that I'm out potting plants. Replaced a 20+ year old scoop with a wooden handle that is still perfectly usable but getting a bit rough because I did nothing to help preserve it. Most places are carrying the rubberized handles now but the wood is hard to find, so was "uncommon" find. I'm only giving it a 4 because it was a Christmas present and the recipient hasn't used it yet. But I was with her when she opened it and it feels good in the hand, the scoop is solid and it's the right size for most gardening. It has the potential for being right up there with Hori-hori. I am going to buy one for me on my birthday in April. I haven't had a chance to use the soil scoop much as I received it at the end of summer. But... it is perfect for small transplanting jobs. The end is angled perfectly and the 'teeth' are sharp so if you have hard pack soil, this will work perfectly. It is very attractive -- if a garden tool can be such! -- and I'm very happy to have it in my arsenal of tools. Highly recommend. I plan to buy a few more for holiday gifts. Just the right size for garden work. Beautiful garden tool. I'm excited to give it to my husband in Father's Day. This is the first scoop I grab when planting. It is comfortable to use. the scoop holds soil for ease of digging holes or replacing soil in pots around a plant. I love it. Uncommon Goods found my favorite garden Trowel, "Soil Scoop" -This is perfect for digging out plants to relocate to other places in the garden. Its tip is curved and pointed for precise extractions. I also use this for precisely digging out weeds in my garden! My Dad has admired this tool for years! I have one and when he helps me garden/plant in the spring, he always comments about how he'd like to get one. So this year, along with a goft certificate from his favorite garden shop, I got him one for Christmas from Uncommon Goods. He was delighted! Solid, good to hold, should be very handy in the garden. East Aurora, NY Snow Country!